We received the Torker KB2 to test out a few months ago and after a few hundred miles, the review is ready to go! There are a few things that I really enjoyed about this bike and basically it comes down to the simplicity of it all. The Torker KB2 is as simple as a fixed gear bike, yet versatile like a geared bike. 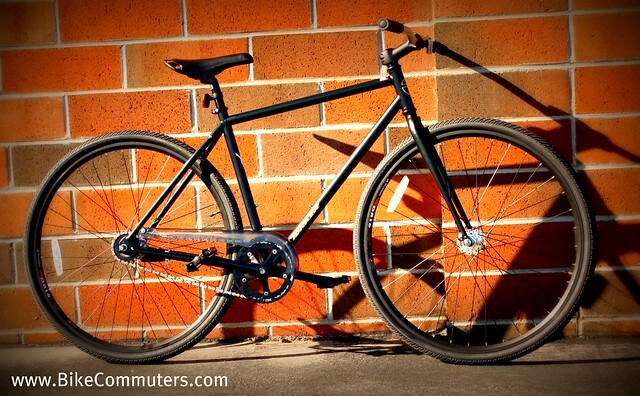 Here’s what I mean by that description; just by looking at it, the KB2 looks much like any other fixed gear bike. No brakes to mess with, no other bells and whistles that could potentially become a problem. All you have to do is get on this bike and ride it. However, because of its 2 speed rear, kick back hub, I can easily climb the tough hills on my commute and still get some speed while on the flat sections of the road. Having a coaster brake on the bike makes it a no brainer, just reverse pressure on the pedals and you stop. Hubs Sturmey Archer Alloy 2sp Internal Rear, Hi Flange Alloy Nutted Frt. But I gotta be honest with you, my first few rides with the Torker KB2 weren’t all that great. It actually took me some time to get used to the idea of kicking back to get to another gear and by habit, I found myself reaching for the non-existent brake levers. But after 10 miles on the bike, I found my groove. 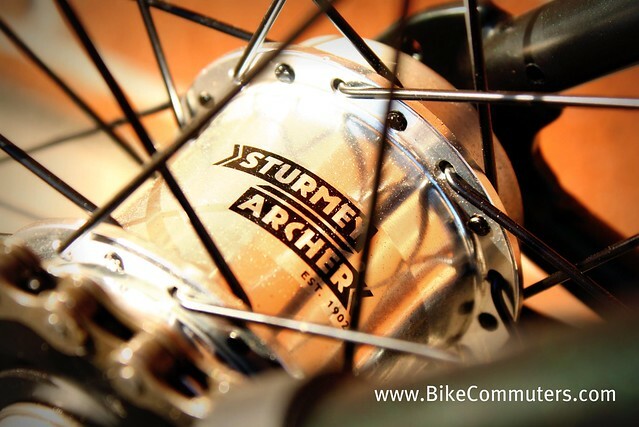 The Sturmey Archer Alloy 2sp Internal Rear Hub turned out to be something very simple to use. You basically have 2 gears, 1 is for starting or climbing hills and the other is for cruising at speed. Braking on the Torker KB2 was a non-issue — meaning that all I have to do is apply the brake and the bike stopped. I was kinda worried about the braking power on it since I do weight 206lbs, but even riding the local hills and having to engage the brake throughout the ride, there was no brake fade at all. Check out these tires; the spec sheet shows them to be Kenda Kwest 700 x 38 but after checking the bike and the Kenda USA website, I couldn’t find the model name. 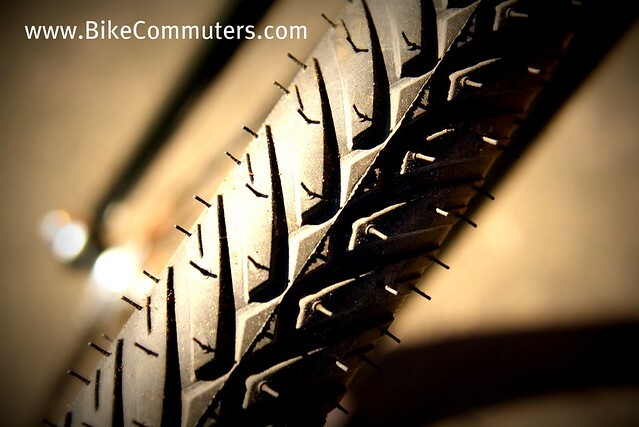 However, these tires have resisted flats during the time I’ve been riding on them. 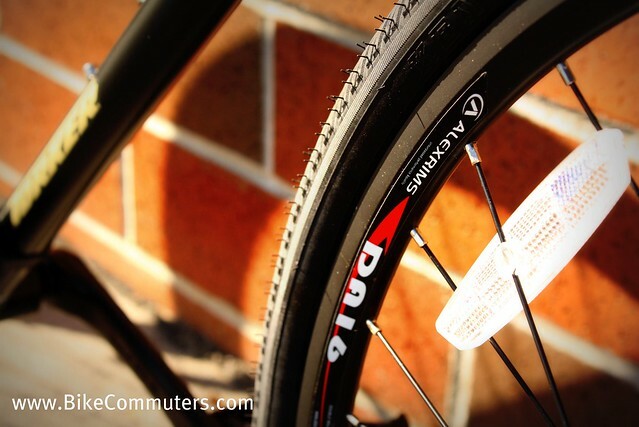 The tread pattern on them is actually pretty aggressive, so I think you should be able to get some decent traction if you were to ride them through fire roads or unpaved bike trails. 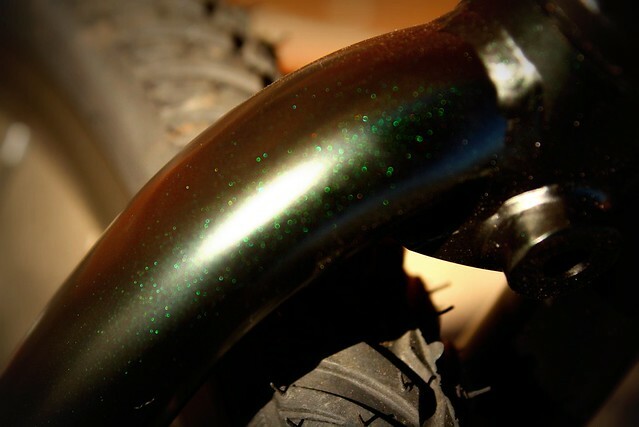 The Torker KB2 shows off its classy styling in various ways; for one, the rivet style saddle which nicely complements the sparkle green color. One thing I have to mention about the Torker KB2: though it is a simple bicycle, it does offer mounts for fenders/racks. The Alex DA16 Double Wall 36H rims have been bombproof. No truing needed during the testing period. Overall I was very happy with the smooth riding and easy to use characteristics of the Torker KB2. I like that I didn’t have to worry about this bike. I just got on it and rode off. No brake cables or levers to hassle with, no dynamo-hubs, no fancy bells and whistles and because of its humble appearance, I wasn’t too worried that thieves would target the bike. The KB2 rides a bit slower than my other 700c cyclo-commuter bike. I’m suspecting it has to do with the lower gear range and possibly the wider tire selection. On average, it was taking me 3-5 minutes longer to complete my 6 mile, one way commute to the office. Where the KB2 lacks in speed, it certainly makes up for it in its durability. I had way too much fun on this bike and there were times I’d look for little jumps to take because I knew that the combination of the fat, high volume tires and its beefy rims could withstand the abuse. When people ask me how the Sturmey Archer Alloy 2sp Internal Rear hub works, I basically give them the following description. I pedal like normal and when I get enough speed to shift to the next gear, I do a quick kick back, but nothing too hard where it would activate the brake, but just enough to hear and feel a slight “click” then continue your pedaling. The gear engages effortlessly and you will feel the difference between gear 1 and 2. Just imagine it to be like going from cog #4 to cog #1 on a 9 speed cassette. 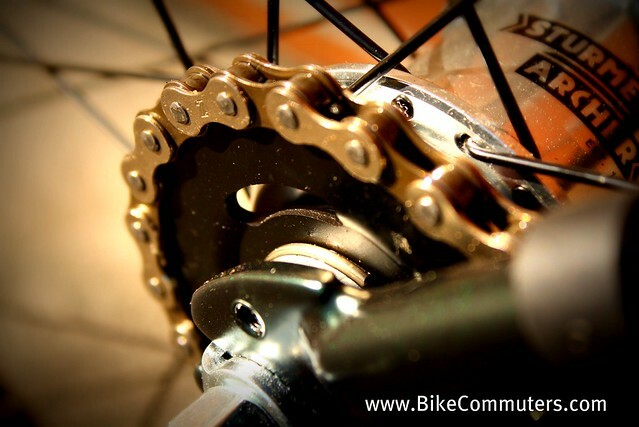 If you mistakenly shifted to gear 2 while trying to stop, the gear isn’t too tall that you couldn’t get started, you just have to put more effort onto the pedals. The only downside to this bike were its funky pedals. I’ve never been a fan of that style. It felt like the outer portion of my foot was slipping off. Other than that, the Torker KB2 is fun, reliable and very affordable ($399). To add a quick note, I never experienced any type of mechanical issues with the bike during my test. With that being said, if you’re in the market for a simple, yet totally unique and durable commuter bike, make sure you check out the Torker KB2, you’ll dig it! I just recently purchased a Torker KB2. 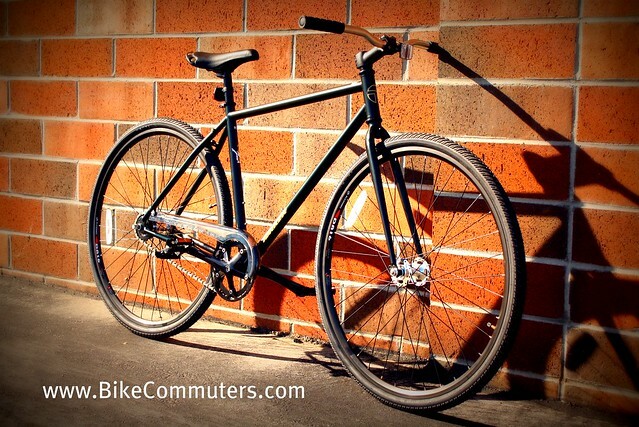 I was looking for a simple relatively inexpensive flatbar street bike that I could bum around on. I already had a cruiser but wanted something a little faster with 700c wheels. After a little research I came across the KB2. I liked the frame geometry but what really caught my eye was the Sturmey Archer 2 speed hub. Singlespeeds have always been a compromise, geared too high for steeper inclines, too low for a fast cruise on the flats. The 2 speed hub helps extend that range. Think of it as a 2 speed transfer case as in a four wheel drive vehicle. High range for regular or higher speeds, low range for the dirt and inclines. With a kickback on the hub to a lower gear, the 42T crank and 22T rear cog worked out pretty well. As the reviewer noted above, it takes a little getting used to. Upon shifting, at first I was back pedaling too far and engaging the coaster brake. After some more time on the bike I eventually got it down to a quick backstroke just enough to shift. You can actually hear the hub click when changing gears. I did upgrade two parts. The low end chainring on my particular bike seemed a bit out of round for an overall even chain tension. I replaced it with a higher quality Salsa ring, 42T x 130 BCD. I tossed the plastic pedals in favor of a nice set of black caged MKS Sylvan touring pedals. These look classy on the bike and support my size 11 shoe well. I also added a front brake. A black Tektro R556 (55-73mm longreach) paired with a Shimano black BL-R550 lever. Not only does this augment the rear coaster brake but also solved a bit of an irritation on braking during a downhill stretch. Backpedaling to engage the coaster brake of course also kicks it into a lower gear. I would then have to backpedal again to get back up in the original higher gear. Just using the front brake alleviates this bit of back and forth. Another thing I’d like to note is the top tube length on the frame sizing. The 50cm has a 550mm effective top tube length with the 54 having a 580 length. So the 50 frame actually fit me a lot better top tube wise even though I take a 54, 55 road frame. I also like a simple no sticker look. All the decals easily peeled off for a cleaner looking bike. The KB2 2speed karate kicking guy on the seatpost was kinda cool though. The bike is also a bit heavy. The Urban Velo review put it at 28lbs. But hey, we’re talking cro mo frame with a hi tens fork on a 400 buck pricepoint. cheapest bike I own but is definitely a good value on the grab, go, and grin factor. Thumbs up on the Torker KB2. Thanks for the great review. This looks like a neat bike, and I’m intrigued by the simplicity of the kick-back gear shift. Thanks for the review, I am seriously thinking of getting one. I’m going to chime in here and say that the KB2 sounds like an amazing commuter bike for the coastal plain. I wonder if I can talk the Missus into it? It’s sad that there’s not enough room for fenders. It’s almost perfect for me, but commuting in the PNW means fenders are a must for 9 months out of the year. I’ve been trying to go SS, but sometimes I’m either too tired or battling a headwind to not shift at least once. Then I started seeing the buzz about the S2C hub. This strikes me as a good choice for someone like me who is multi-modal (bus/bike at least). No derailleur to get banged up while locked to the rack, no shifters for kids to play with. Unfortunately for me, there are no Torker shops in my town. There are a couple that do business with SBS, and will special order Redline CX bikes all day long, but neither is keen on ordering a Torker (I tried to get a Graduate a couple of months back). Hey No1Mad, where do you live? Torker’s store locator leaves a lot to be desired. Anybody know any shops in Portland, OR that carries the KB2? GDorn, in Portland, OR I ordered my KB2 through Joe Bike, 3953 SE Hawthorne. Small but friendly LBS. In fact one of the mechanics had an SA 2 speed hub installed on his personal commuter bike and gave me a demo before I ordered the bike. As noted in my earlier post, make sure you look at the geometry specs, especially top tube length, to ensure proper sizing. SBS – Seattle Bike Supply – is the distributor for this. Yeah, I’ve been calling around Portland as well. A few shops carry Torker some of the time, but not many keep em in stock. I’d even settle for an in-person look at the U-District, since the geometry is pretty similar. I had a Schwinn kickback years ago and loved it- would be awfully nice to have that hub on a nicer, better-fitting frame. I think some shops may be stocking up soon for spring and summer, so maybe then I’ll be able to track one down for a test ride. Hey, RL Policar and PDXbiker, thank you both for your very helpful reviews. I rode this bike briefly at a shop while on a recent business trip. The shop guys recommended a front brake like PDXbiker’s, but I wonder, RL Policar, do you agree that it’s needed for basic town riding? 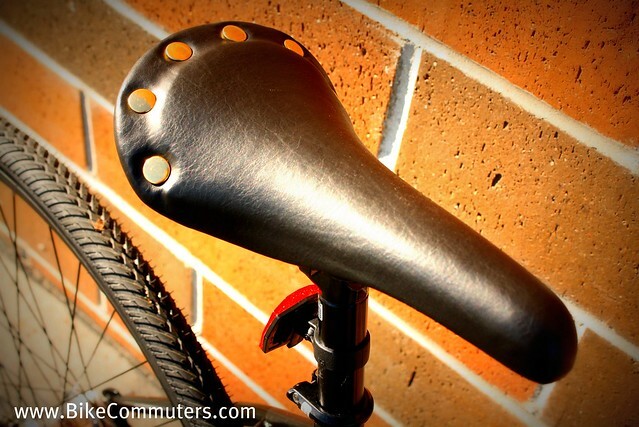 And how about the rivet saddle? I found it too hard. Did you get used to it after a while? Finally, how tall are you guys and what size frames do you have? I’m small, 5’6 135 lbs, and tested the 50cm. It seemed OK to me, but maybe I should try the 44? Thanks again. I’m 5’7″, I am riding the 52cm. Front brake is a good idea. But I didn’t feel like I needed it. The saddle wasn’t bad, perhaps you just need to break it in. I really want one of these to tool around on with my kids. I plan peeling the stickers off for that clean look. Then I want to switchbthe tires to schwalbe creamers. I think the deep green will go really with the cream tires and give it a realty cool old-school look. I may even add a sprung seat, moustache bars, and that would be the it. I can’t test ride one around here. The local suppliervdoes not keep them in stock. I would love to buy a KB2 but I live in Canada, does anyone know how I could get one shipped up to Northern British Columbia?! Thanks in advance. @Fraser — any bike shop with an SBS (Seattle Bicycle Supply) account should be able to get one of these for you. Or, you could contact Torker directly at torker@seattlebikesupply.com to see if they can assist you. Thanks for the great double review~! I want one! do you think drop bars would work? I’m small so less than an inch clearance without shoes but I may try it. Are we sure fenders don’t work? I thought my lbs had these hopefully they can get them. I live close to st louie. I purchased a Torker KB2 a couple weeks ago and so far it has been a mostly pleasant surprise. In the mid-60’s, my first “big-boy” bicycle was a Schwinn 26 inch ‘Racer’ model with a two speed Bendix coaster brake rear hub, so the KB2 was very appealing. After about 200 miles on the KB2, I have a few things to note. First, it seems to be well built and is responsive, fun to ride, and a very good value for the price. Second, however, there is definitely a break-in period. 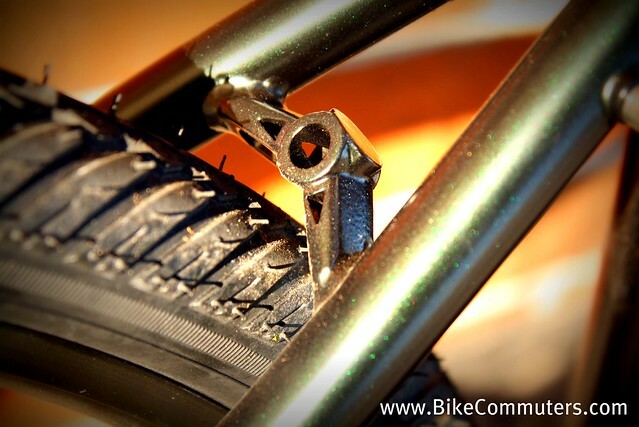 Initially, the coaster brake performance was uneven and when applying back pressure to slow down, it would alternate between grabbing and slipping that you could feel in your feet on the pedals. Each time it grabbed, it would cause the wheel to emit a loud pang sound as the spokes resonated guitar-string like to the sudden jolt. The pang sounded very much like a spoke popping. After two weeks, the coaster brake is now much smoother and the panging noise is thankfully all but gone. Unlike my old Bendix hub that had an underdrive (ratios like 0.6:1 and 1:1) the Sturmey-Archer is an overdrive (ratios like 1:1 and 1.4:1). I have taken both hubs apart and the Sturmey-Archer is quite simple inside and was completely packed with grease. The Bendix is more complex, but very bomb proof and probably a little better 2-speed coaster brake hub. Overall, I think you can’t go wrong the the Torker KB2 for buzzing around town or cruising on a local bike path. The hub failed with less than 100 miles. Less than 1 month of riding. Zero abuse. On a lightly built roadie! Meant to say less than 1000 miles. No big difference there, really! Well, it should be covered under warranty, wouldn’t it? Seems pretty limited with the sizes. I’m between 6’3″-6’4″ with about a 34″ inseam, would the 54 frame be way too small for me? Got my KB2 on 4-6-2013 and I really love it. The bike is what I would probably describe as candy apple red. All of the lettering and logos are painted on. The 2 speed kickback feature is beyond cool. It functions flawlessly and isn’t making any weird or annoying sounds. I have noticed that the rear coaster brake seems a bit grabby compared to my other bike with coaster brakes. But I don’t see it as a problem. I have added a few things to this bike to dress it up and personalize it. First, I got rid of the seat and replaced it with a spongy wonder bike seat from Canada (spongywonder.com). It wasn’t cheap but I like it much better than the stock seat and it looks cool……and kinda strange. I also added a 3″ extension to the stem, locking grips and padded bar extensions. To top it all off, I also put on a kickstand and of course a water bottle and cage. I am 5’6″ and I purchased the the 44cm version based on what the guys thought at the shop. However, for me to ride this bike comfortably I have the seat post tube maxed out to the minimum insertion mark on the tube. I can’t help but wonder if I should’ve sized up to the 50cm version. The 44cm seems to be on the borderline for me. Any thoughts on this would be appreciated.